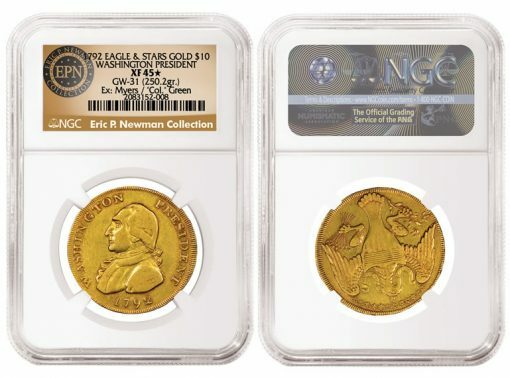 Numismatic Guaranty Corporation (NGC) has certified the late Eric P. Newman’s most cherished coin: the unique 1792 Washington President gold eagle that researchers believe was presented to George Washington and carried by him as a pocket piece. August’s sale marks only the third appearance of this extraordinary rarity in auction — and the first since 1890. After Washington, only eight elite numismatists have held this gold coin. The famed "Colonel" E. H. R. Green purchased it privately in 1933 for over $2,500, a significant sum for the day. Eric P. Newman acquired the coin in July 1942, and since then it has remained in his collection. "This is one of the most amazing treasures that I have examined in my nearly 40-year career," said Mark Salzberg, NGC Chairman and Grading Finalizer. "NGC is honored to have been selected to certify a coin with such remarkable history, provenance and appeal." Newman, one of the greatest numismatic researchers and writers of all time, believed that this coin was struck as a pattern (a proposed coin) for a gold eagle, or $10 piece, and was expressly struck for, presented to and carried by George Washington. Further research indicates that this coin was produced in America by Jacob Perkins of Newburyport, Massachusetts, rather than in England as previously believed. The obverse of Newman’s unique gold pattern features a bust of Washington surrounded by "WASHINGTON PRESIDENT" and the 1792 date. The reverse features a heraldic eagle based on the Great Seal of the United States. It bears an edge lettered UNITED STATES OF AMERICA. Newman, who passed away in November 2017 at the age of 106, assembled one of the most important collections of coins and paper money, with a particular focus on Colonial and Early Federal US pieces. Newman’s coins, which have been entirely certified by NGC, have achieved nearly $59 million at auction in a series of sales by Heritage Auctions since 2013. Of all the great rarities owned by Newman, the 1792 Washington Gold Eagle was the scholar’s favorite. He explained why in 1975: "This coin is unique in that it was owned by George Washington. It is unique as the earliest gold pattern prepared for the United States coinage; and it is unique because only one example of the coin was made. What other American coin can command historical and numismatic respect of that magnitude?" "NGC was the logical choice to grade this important rarity due to the tremendous success of the past NGC-certified selections," said Stuart and Maureen Levine, advisors to the nonprofit Eric P. Newman Numismatic Education Society (EPNNES). "We look forward to the history-making sale in August." For more information about the sale, visit Heritage Auctions’ website HA.com. To view all of the NGC-certified selections from the Eric P. Newman Collection, visit NGCcoin.com/Newman.